To legalize or not to legalize? That is the question on the minds of many Michiganders this election season. Michigan voters are set to decide on a recreational marijuana ballot proposal on November 6. Michigan and North Dakota will both vote on initiatives to legalize the adult use of marijuana during this midterm election. Utah and Missouri residents also will have the opportunity to vote on referendums for medical cannabis. Josh Hovey, communications director for Coalition to Regulate Marijuana Like Alcohol, the main group backing the proposal, says Michigan’s Proposal 1 will bring two primary benefits to the state: Stop wasting law enforcement resources enforcing what his group says is a failed law, and and increasing revenue for some of the state’s most important needs, through taxing and regulating marijuana. “We arrest more than 20,000 people every year for marijuana possession in Michigan, and 70 percent of those arrests are for a quarter ounce or less,” Hovey said. “Michigan spent $90 million enforcing marijuana possession in 2010 alone. This is an incredible waste of our tax dollars that could otherwise be used toward other priorities — especially when you consider that marijuana is less harmful and less addictive than alcohol or tobacco and has legitimate medicinal value. And when you look at arrest rates, minorities in Michigan are 2.5 times more likely to be targeted. So legalization will also ensure minorities communities are no longer unfairly caught in the criminal justice system and denied opportunities that are no longer available due to having an arrest record. The Senate Fiscal Agency is estimating $287 million in annual tax revenue by 2023, Hovey said, adding that the extra funds will be divided between roads, schools and local governments where marijuana businesses are allowed to operate. Allow individuals age 21 and older to purchase, possess and use marijuana and marijuana infused edibles, and grow up to 12 marijuana plants for personal consumption. Create a state licensing system for marijuana businesses including growers, processors, transporters, and retailers. Permit commercial sales of marijuana and marijuana-infused edibles through state-licensed retailers, subject to a new 10% tax earmarked for schools, roads, and municipalities where marijuana businesses are located. A recent poll conducted for the Detroit Free Press shows the ballot initiative in considerably favorable standards, however there is opposition. Since Michigan voters adopted a medical marijuana referendum in 2008, the state’s marijuana industry has grown, but not without a fight. Legislators and private groups have tried to limit the scope of medical marijuana, from authorized raids on legal medical dispensaries, to re-zoning efforts, and forcing dispensaries to re-brand as “provisioning centers” which one dispensary owner says cost him nearly $25,000 which he had to come up with during a short window in order to continue operating. Detroiter Ryan Harroun says he was skeptical at first about a ballot initiative to legalize recreational marijuana, saying he would like to see a full government deregulation of marijuana and the release of people incarcerated for cannabis-related offenses. He also says he’s concerned that the plant could become another pawn of big business. Harroun says he doesn’t think keeping drugs illegal is curbing their use at all. “I don’t think anything would change except maybe there would be less shame, and it would be easier to get help with addiction,” he said. 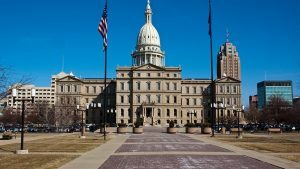 If recreational marijuana gets the green light in Michigan, all cannabis products would come from licensed businesses that are regulated by the Michigan Department of Licensing and Regulatory Affairs (LARA). “LARA will be responsible for ensuring quality control standards, packaging and labeling requirements and ensuring that businesses are not marketing to kids,” Hovey said.